When we talk about easy chicken recipes we really must include this recipe as it has been one of the best and most delicious chicken recipes in our family for many years. My grandmother made this recipe twice a year. She called it her special. When we all gathered at her home we seemed to act like the young children we once were. It was a special day. The two days per year were special anniversaries for them. Granddad celebrated his birthday July 1st. And their wedding anniversary was celebrated April 1st. Those were their special days and we could not wait to celebrate with them by arriving early and helping to prepare one of what she called her quick and easy dinner recipes. Melt ¼ cup butter in a saucepan. Add half the chopped onion and sauté for 3 to 4 minutes, until softened. Combine sautéed onion with bread crumbs, chopped ham, herbs, and grated lemon rind. Add enough beaten egg to make a fairly moist mixture. Season with salt and pepper. Spoon stuffing onto the cavity of the chicken. Put remaining onion and some salt and pepper inside the neck end of the bird with a small amount of butter. Fold the skin flap under the wings and skewer or sew to hold in place. Rub the remaining butter over the chicken and sprinkle with salt and pepper. Heat oil in the frying pan. When hot, add chicken, baste thoroughly. Cover with foil. Roast, basting every fifteen minutes, turning chicken from side to side. Allow about 20 minutes to the pound. During the last 15 minutes of cooking time, remove the foil to allow breast to brown. Transfer chicken to a hot serving dish and keep warm while making gravy. Pour off fat from the roasting pan. Pour in remaining stock and bring to a boil. For more flavor, reduce liquid by boiling. To prepare bread sauce, stick the cloves into the onion. Place onion, milk, herbs, peppercorns into saucepan. Cook gently for 20 to 30 minutes, without boiling. Place breadcrumbs in saucepan. Strain milk over breadcrumbs; heat together, stirring constantly, until creamy. Stir in butter, cream and salt. Serve hot. Pre heat broiler. Roll up bacon and put on skewers. Broil bacon and sausages until crisp. Serve chicken surrounded by bacon rolls and sausages. Serve chicken gravy and bread separately. These easy chicken recipes will have your family or guests clamoring for more. 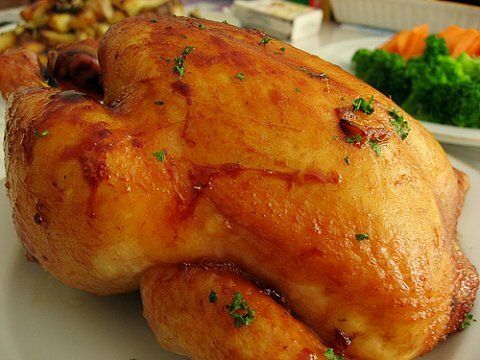 Easy chicken recipes are great to cook up when you are parked in your RV by a river or lake. The combination of ingredients will smell wonderful and will have the whole area in the campground wondering where the terrific aroma is coming from. A nearby Chinese restaurant serve the best general tso chicken recipe you will ever taste. Zesty comes to mind. They also serve up a great almond chicken recipe. We also like to cook the chicken and sausage gumbo as well as chicken cordon blue and greek chicken. We like to have some extra meals Irma makes before hand such as when she makes chicken pot pie recipes.